Malus 'Donald Wyman' is a popular large crab-apple tree which has a pleasing appearance in the garden. The blossom is white and borne in great profusion. The fruitlets are very small, but remain on the tree into early winter, providing interest even after the leaves have fallen. Please fill in the details below and we will let you know when Malus Donald Wyman crab apple trees are back in stock. 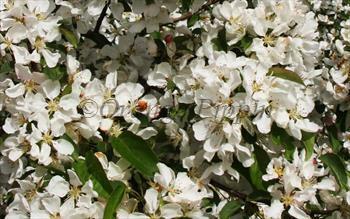 Malus Donald Wyman is in flowering group 3. Malus Donald Wyman is self-fertile and does not need a pollination partner, although fruiting may be improved if there is a compatible tree of a different variety nearby. Do not be put off by Internet reports of this variety's susceptibility to fireblight - it is rarely a factor in the UK climate. This variety is named after Donald Wyman, a horticulturalist at Harvard University in the USA where this variety was discovered.